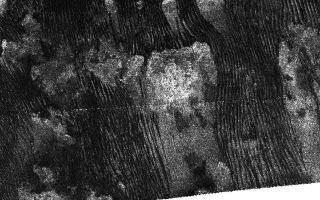 This cool space wallpaper is a radar image from the Cassini orbiter showing dark streaks carved into dunes on Saturn’s moon Titan. This cool space wallpaper is a radar image from the Cassini orbiter showing dark streaks carved into dunes on Saturn’s moon Titan. While sand on Earth is composed of silicates, the ‘sand’ of these alien dunes is formed from grains of organic materials about the same size as particles of our beach sand. The small size and smoothness of these grains means that the flowing lines carved into the dunes show up as dark to the human eye. This image was released March 27, 2014.